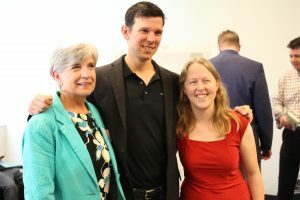 Susan Stoltenberg, Impact NW Executive Director; Sam Blackman, Elemental Technologies CEO; and Kim Menig, AKA Science Program Supervisor celebrate the $30,000 grant! We are excited to announce that Elemental Technologies has presented Impact NW with a $30,000 gift, distributed over three years, to our AKA Science (All Kids Are Scientists) program! Elemental has provided volunteer support to AKA Science since 2013, and has contributed 200+ volunteer hours to the program. AKA Science is a fun, interactive after school science program for elementary school students. Kids participate in hands-on experiments that nurture their curiosity, get them excited about science and learning, and help them explore the world around them. AKA Science currently offers 70+ classes per term at 50+ schools (primarily in the Portland Metro Area), and has provided high-caliber, engaging science experiences to more than 11,000 kids since 2004. “I’m bowled over by Elemental’s generosity, which will make an enormous impact on our program. Especially when I think about all the ways Elemental Technologies has already made a huge impact on our program… I’m deeply, profoundly grateful,” said Kim Menig, AKA Science Program Supervisor. Elemental formed the Elemental Community Investment Fund (ECIF) to provide a source of more sustainable, longer-term funding than is available through traditional one-time corporate giving. ECIF grants focus on non-profits based in the Portland metropolitan area that address education, hunger and the environment. 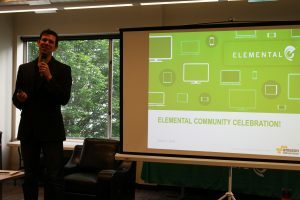 The $30,000 grant was announced at the unveiling of Elemental Technologies’ new Community Investment Fund, part of The Oregon Community Foundation, which distributes $10,000 in funding annually for three years to three Portland metropolitan area-based organizations, including Impact NW. Alongside the AKA Science program at Impact NW, LIFT Urban Portland and Depave received grants from the Elemental Community Investment Fund. Impact Spotlight: Elemental Technologies Don’t turn your NW Natural Gas off this summer—we can help!